Yesterday I had the opportunity to coordinate a Styled Shoot at Stone Creek Inn . Every moment of yesterday was amazing. Shannon Ford Photography contacted me in late December about doing a shoot in January. I was ecstatic because I adore her work. First I knew I had to come up with a color scheme. I have always loved the way deep maroons, green, and ivory look in the winter. Once I had that in place I communicated my vision to my vendors. As soon as I communicated and had a date I was hopeful that everyone would commit. Sure enough, I only had to ask once and every vendor said yes. I was thrilled. Stone Creek Inn has many different areas to photograph. I wanted to make sure we had the right decor in place for each setting. Throughout the last 3 weeks, I had mixed and matched different chargers with different plates and goblets until my mom, neighbor, and calligrapher (Honey+Olive Lettering) help me decide on an ivory plain plate, ivory salad plate, cream napkin, crystal goblet, watercolor goblet, brass candlesticks, ivory candles, and a beautiful flower centerpiece. Once I had the table underway, I went with my florist (Barbara Dean Designs), to Reeves and picked out all the different flowers that matched my color scheme. That was such a fun experience and I really learned a lot. The Friday before the shoot, I went to Barbara’s house and put the bouquet together as well as the centerpiece. I had packed my table decor and put a mock table together to get the full effect. I was in love. That Saturday night, I packed all my decor and made sure I sent a timeline to all my vendors including my models that day. Sunday morning was the big day! I arrived at 10:00am and Stone Creek Inn already had the sweetheart table with a linen and another table near the pole barn with a linen. I unpacked my items and place the sweetheart table together with my style I had created. Shortly after, Honey +Olive Lettering came with her amazing signs and place cards as well as gorgeous handwritten maroon and gold addressed envelopes. Kakes by Kena arrived and made an amazing 2 tiered ivory ribbed cake and when Barbara Dean Designs arrived we decorated the cake with blush and maroon colored roses as well as seeded and silver dollar eucalyptus. The magic started transforming when my model bride and groom came and Deborah Moore Makeup and Hair started her talents. Shannon Ford Photography shortly arrived and started capturing moments of my bride and her groom getting ready first. She then we to the reception hall with our already set up cake and beautiful table. 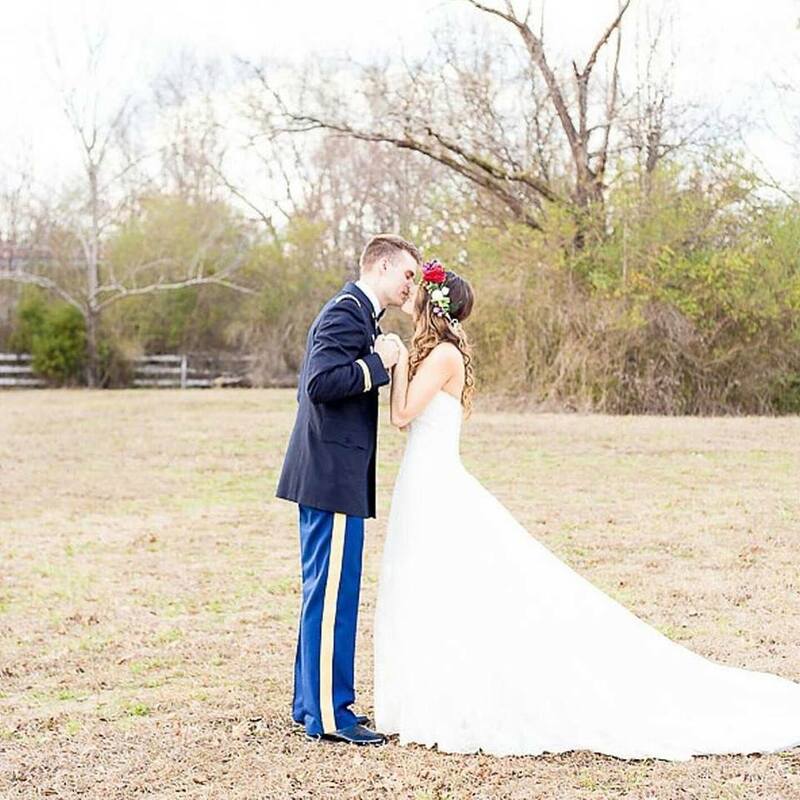 My groom wore his army blues and he still had his look of awe staring at his beautiful wife in this shoot. For some of the pictures the bride wore an amazing flower crown by Blair Bailey Design. This crown captured every vendors heart at the shoot.. including our model bride. We moved over near the creek which is surrounded by at least 5 acres. Honey +Olive Lettering took one of my mother’s old mirrors and transformed the looks by writing “Just Married” on the mirror in white. Barbara Dean Designs and I decorated the mirror with more eucalyptus and roses. I can not wait to see the pictures out in that area. We then had an another idea by moving the sweetheart table outside and getting better lighting. I have realized there are a lot of options for pictures just by moving objects around. We made our bar outside in the pavilion with my Moscow Mule set, gold hammered tray, and Honey +Olive Lettering glass lettered sign. This was a collaborative effort and turned out gorgeous. At the end of the day we all said our goodbyes. I was so excited that everyone met each other and really networked. I loved being able to coordinate a shoot like this where we all worked so well together. I am so anxious to see more professional pictures by Shannon Ford Photography.